A lotto winner could not claim the jackpot prize after his lucky ticket got ironed out, thereby losing his chance to become P12 million richer. Antonio Failon Mendoza, a former overseas Filipino worker (OFW), has hit the winning combination 09-21-31-36-40-41 with a jackpot prize of P12,391,600 during the October 2, 2014 lotto draw. He bought the lucky ticket at a lotto outlet in Barangay Dacanlao in Calaca, Batangas. Mendoza initially thought he got five digits. After reviewing the ticket, he found out that he had hit six. He was very happy and excited, thinking that his winnings would lead to the improvement of his family's living condition. Unfortunately, luck took a wrong turn. While getting ready to claim his prize, one of his grandchildren suddenly took the ticket—the sole evidence that he won—and got it crumpled! He said an in-law suggested to have the ticket smoothened again by pressing. Roxanne Sandoval, another grandchild of Mendoza, did the ironing. What happened next was worse. 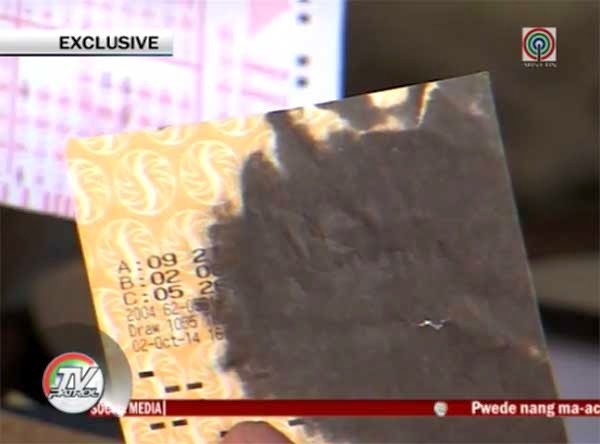 The lotto ticket made of thermal paper got burnt due to extreme heat! Mendoza already went to the Philippine Charity Sweepstakes Office and presented the charred ticket with high hopes that he can still claim the prize. The PCSO has confirmed that the winning combination came from the lotto outlet where Mendoza placed his bet. However, the agency follows a "no ticket, no payment" policy. PCSO's acting chairman, general manager Ferdinand Rojas II, said in an interview that the winning ticket should be machine-readable. Mendoza's ticket, he noted, is not. Rojas clarified that the PCSO's legal and technical teams are looking for ways to address the claimant's problem. Winners, he said, has up to one year to claim.